WASHINGTON—On the same day GOP President Donald Trump exercised executive overreach – again – by trashing the Affordable Care Act in federal courts, progressive groups, and lawmakers, led by at least one union, united with Democratic leaders to defend it. But they also faced off over the fate of Medicare For All. And in one fell swoop, health care became a top issue for the presidential campaign, which has already started. Trump renewed the GOP’s war on the ACA, a war Steelworkers President Leo Gerard once said occurs because the Republicans hate everything President Obama did because Obama is African-American. But 62 U.S. House votes to repeal the ACA went nowhere in the GOP-run Senate during the last Congress. This time, Trump announced his Justice Department would not defend the ACA in federal appeals court in New Orleans after a right-wing federal district judge in deep-red Texas declared the entire law unconstitutional. The Texas judge did not issue an injunction abolishing it, however. Trump said the GOP would come up with a replacement scheme, but that’s another lie. Despite their mantra of “repeal and replace” the ACA, Republicans never have. They prefer to leave millions of people, insured and uninsured, to the “mercy” of venal profit-driven insurers who routinely inflict high deductibles and co-pays on consumers, then refuse to pay for care. While campaigning for their respective health care bills, both Pelosi and National Nurses United, the lead union in the Medicare For All drive, jumped on Trump. So did Democratic presidential hopefuls, most of whom have endorsed Medicare For All, HR1384. 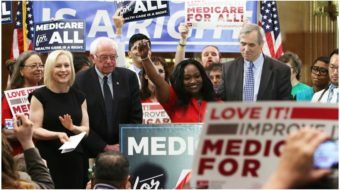 Sen. Bernie Sanders, Ind-Vt., its lead sponsor and the lawmaker responsible for inserting Medicare For All into the national debate during his presidential campaign four years ago, blasted Trump’s abandonment of the ACA in the federal courts. “Trump and his administration are trying to take health care away from millions of Americans – again,” tweeted another hopeful, Sen. Kamala Harris, D-Calif. Even more than Sanders, she’s been the most outspoken proponent of completely abolishing the health insurance industry. But while Trump schemes to trash the ACA, and replace it with nothing, the Democratic leadership on one side and NNU and its allies on the other first defend it but then disagree on whether Medicare For All should replace it. House Speaker Nancy Pelosi, D-Calif., and Democratic leaders want to improve the nine-year-old ACA by explicitly banning insurers from throwing people with pre-existing conditions off the health care rolls. They also want to free Medicare to negotiate drug prices down from the heights set by Big Pharma. Pelosi, House Majority Leader Steny Hoyer, D-Md., and health care committee chairs introduced that “sweeping reform” – Pelosi’s words – on March 26, the same day of Trump’s announcement. Medicare For All would negate Trump’s move by completely overriding the ACA. Pelosi’s measure might not trump Trump, but it would protect against insurer discrimination for pre-existing conditions and driving down prescription drug prices played well on the campaign trail last year. Last month, news reports surfaced that Pelosi decided to sidetrack Medicare For All – whose winning advocates helped swell the number of women in the U.S. House to a record 110 – by sending the legislation to the House Budget Committee, which doesn’t write regular legislation. On March 26, Pelosi went even further. Carrying out what she said was a main plank of the party platform, Pelosi and the leaders formally unveiled their health care bill. Their measure would reverse Obama’s major concession to Big Pharma a decade ago when the Affordable Care Act banned Medicare bargaining with drug firms over prices. The leadership legislation also reaffirms, by explicitly writing into the ACA, a ban on health insurers’ throwing people out of coverage because of pre-existing conditions. Both topics played well on the campaign trail last year and helped the Democrats pick up 40 U.S. House seats and take back the majority. Pelosi called the leadership health care measure “sweeping.” NNU Co-President Zeni Cortez, RN, didn’t. Neither did the San Francisco Board of Supervisors in Pelosi’s progressive hometown. It passed a resolution on March 26 endorsing Medicare For All, HR1384. 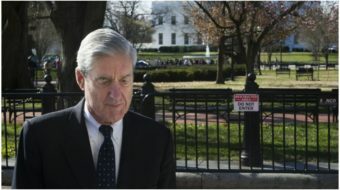 “Last night, in federal court, the Justice Department of the Trump administration – you’d think they have more to do – decided to not only try to destroy protections for pre-existing conditions, but to tear down every last benefit and protection the ACA affords,” Pelosi told the press conference where she unveiled the leadership’s health care bill. The House may be for the people, but opinion polls show more than half of the U.S. people want single-payer, government-run national health care, Cortez retorted. San Francisco’s supervisors backed her up. 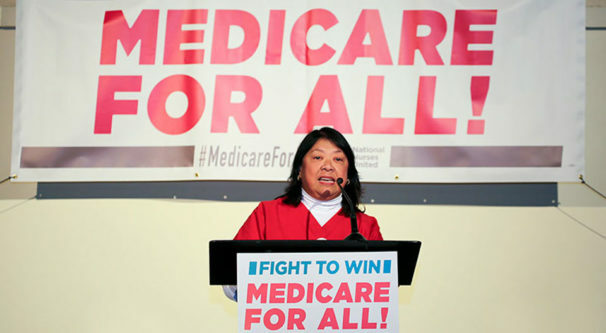 “The Medicare For All Act of 2019 is backed by over 100 members of Congress” including the Congressional Progressive Caucus, Cortez noted. CPC Co-Chair Rep. Pramila Jayapal, D-Wash., is its lead sponsor. The CPC is the largest caucus in the House. HR1384, much more detailed than previous Medicare For All bills, “will guarantee quality health care for everyone – real patient choice, not the restrictions imposed by all private insurance plans, without devastating out of pocket costs,” Cortez said. 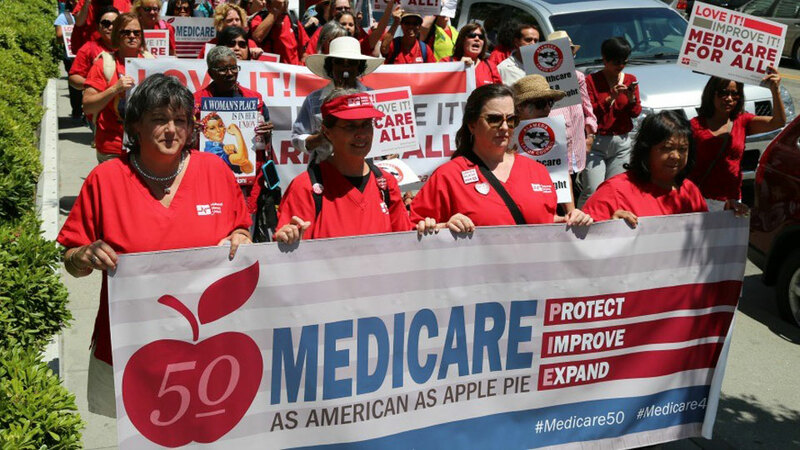 That grassroots movement includes NNU Medicare For All walks in individual communities around the country, on virtually every weekend and many weekdays as well. NNU sends out texts about the walks. The movement also includes support from other progressive groups and unions. Backers include the Coalition of Labor Union Women, the Labor Campaign for Single Payer, the Teachers (AFT), the Postal Workers, the Association of Flight Attendants-CWA, the Brotherhood of Maintenance of Way Employees/Teamsters, the Debs-Jones-Douglass Institute, the Theatrical and Stage Employees (IATSE), the Machinists, the Professional and Technical Engineers, the National Union of Healthcare Workers, the New York State Nurses Association, the Service Employees, the Amalgamated Transit Union and the United Electrical, Radio and Machine Workers. “This is the right bill at the right time and we commend and thank the Board Of Supervisors for your leadership and for urging all congressional representatives from San Francisco and throughout the state to support this legislation, including House Speaker Pelosi. Are you listening Madam Speaker?” said RN Juli Carter at an outside rally before the supervisors’ meeting. Carter spoke for the California Nurses Association, NNU’s largest affiliate, and one that has pushed single-payer in state legislative halls for years.